There’s a giant lurking in the deep waters around Roatan and it’s not the giant squid from 20,000 Leagues Under the Sea. 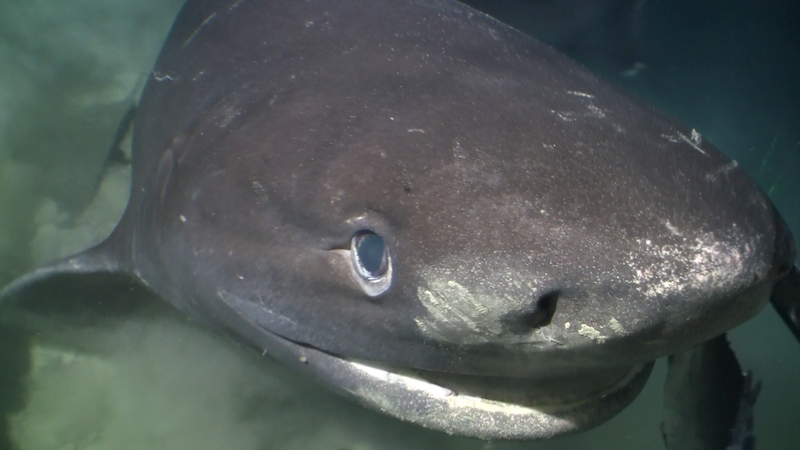 Sixgill sharks, which can grow up to 18 feet in length, are rarely seen by divers, but your chance of seeing one increases exponentially by taking a submarine down to 1500 feet on a dark night. These sharks, and other species like the Caribbean reef sharks that swim closer to shore, have been fully protected in Honduras since 2010. Bahamian leaders had the foresight to ban longline fishing nearly 20 years ago and tour operators have been reaping the benefits ever since. Each year, shark diving brings in about $78 million to this small Caribbean nation; that’s equivalent to about $200 for every person living there. The Bahamian leaders of today recognize the importance of sharks and in recent years have strengthened the laws protecting them. The currents at several dive sites in the Rock Islands are so strong that you have to use a reef hook – a stainless steel hook on a six foot line that latches to your slightly inflated BCD – in order to not be swept away. As you float with both hands free, nutrient rich upwellings wash over you, attracting a buffet of smaller fish and scores of grey reef sharks and other large predators. 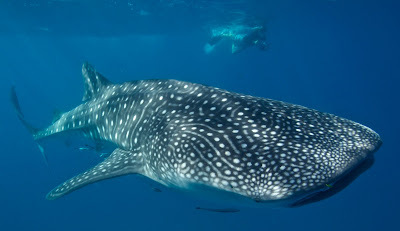 Whale sharks grow to be as big as a school bus. They are usually solitary creatures, but at certain times of year in only a few places, they aggregate into huge schools to feed on zooplankton. The largest school congregates offshore of Isla Holbox on the Yucatan Peninsula in Mexico. 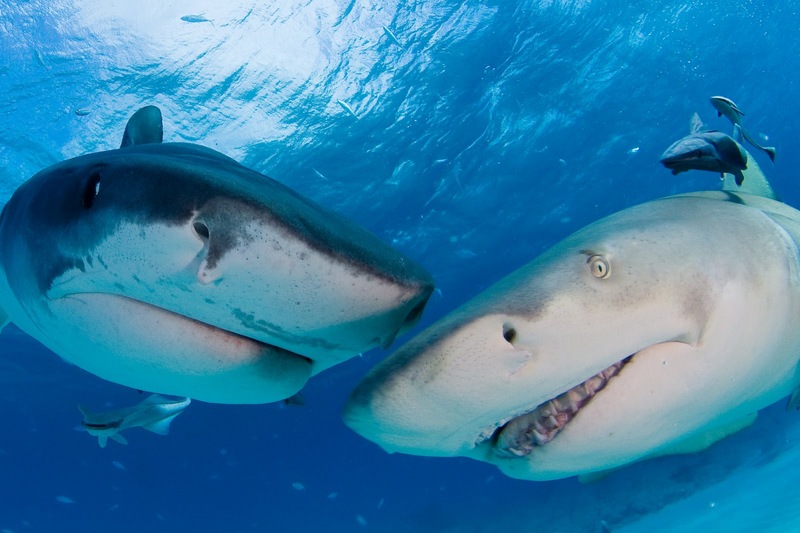 In 2011, over 400 sharks were counted in an area the size of just a few football fields. ﻿ The little island that inspired 28 Godzilla movies and gave name to the skimpy bathing suit is known among divers as one of the world’s best kept secrets. Closed to outsiders for most of the second half of the 20th Century, Bikini Atoll is now open to divers, provided they have the time and fuel to get there. Sharks are protected in all 34 atolls that make up the Marshall Islands, a sanctuary for sharks four times the size of California. ﻿ Manta Rays are close relatives of sharks; think of them as vegetarian flat sharks. 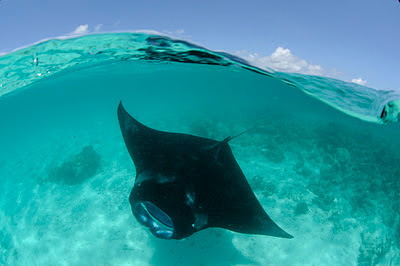 The largest mantas grow to 7.6 meters (25 feet) from wing to wing. At Hanifaru Bay in Baa Atoll divers can witness over 250 of these gentle giants swimming and feeding on zooplankton in a giant swirling vortex. 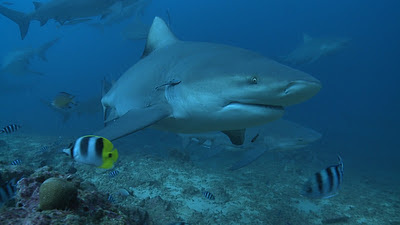 ﻿ There is a legend of an ancient shark in Fiji named Dakuwaqa. 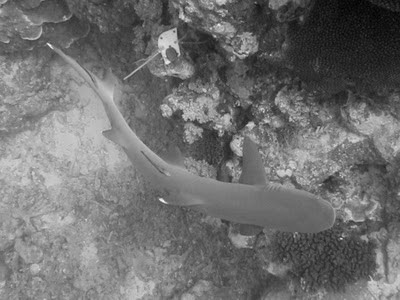 Many Fijians believe this shark guardian is their protector and do not fear him, but they do respect him. Swimming with sharks in Fiji is not for the faint of heart. Shark Reef is the only place in the world where you can encounter up to 8 species of shark on a single dive, including over 100 individual enormous bull sharks. Oh, did I mention they don’t use a cage? 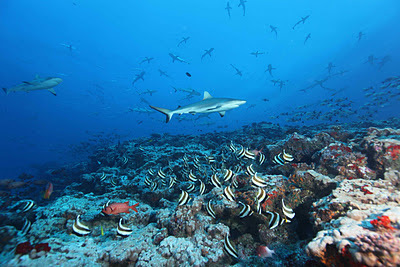 ﻿ ﻿Since ancient times, Tahitian people have demonstrated great respect to sharks. 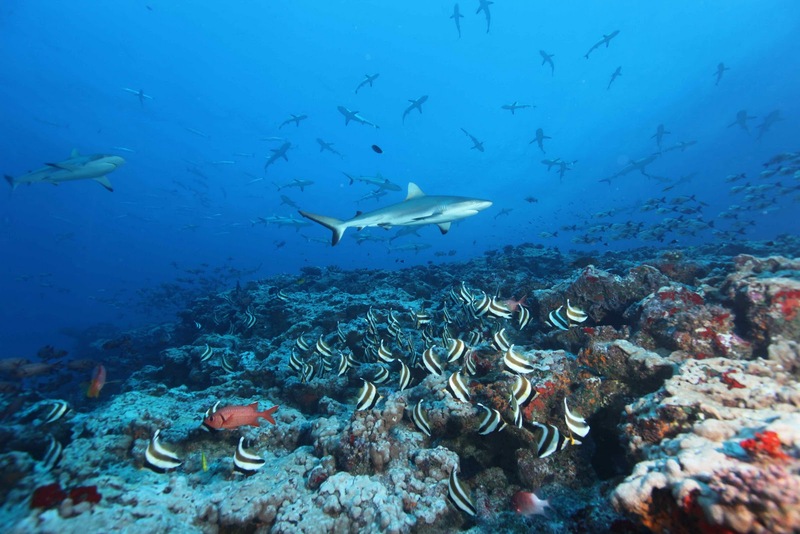 Therefore it is not surprising that French Polynesia became one of the first places in the world to protect sharks, closing down the shark trade in 2006. Shark diving is the highlight of a trip to these remote tropical islands, with up to 15 different species of sharks swimming naturally in schools by the hundreds. 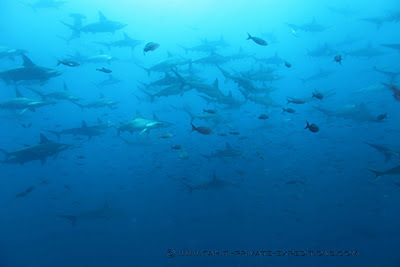 ﻿ Cocos, Galapagos, and Malpelo are the three corners of the Hammerhead Triangle in the Eastern Pacific Ocean. At each location, hundreds, and sometimes thousands, of hammerhead sharks are attracted by schools of fish feeding on nutrient rich upwellings around seamounts and isolated islands. 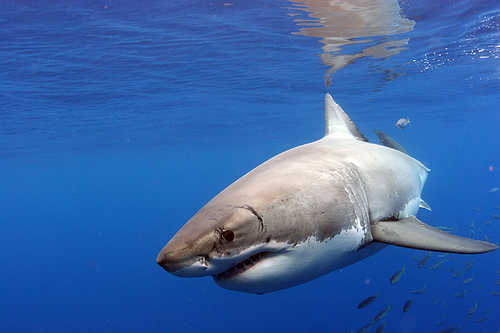 ﻿﻿﻿ At Isla Guadalupe, divers can get eye to eye with the shark that made millions afraid to get in the water. Great white sharks may be the ocean’s top predator, but they are assessed as vulnerable to extinction by the International Union for Conservation of Nature. 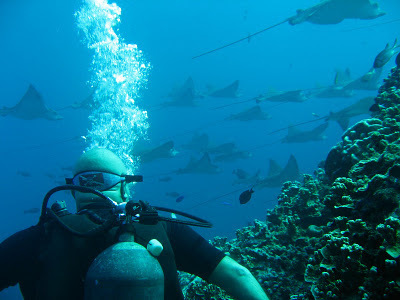 Home to one of the world’s largest marine protected areas, the small island chain running along the famed Mariana Trench is famous for schools of spotted eagle rays. With a wing span of up to three meters (10 feet), as many as 80 of these graceful creatures can be seen interacting with cleaner wrasses that live on coral heads just outside Saipan Island’s fringing reef. 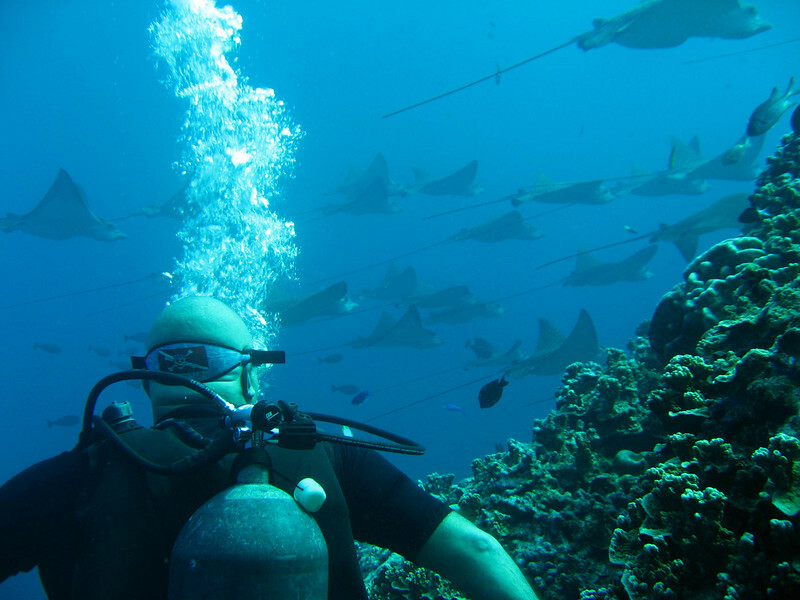 With an economy that depends almost entirely on tourism, island leaders saw the need to protect these important species and banned the fishing of all shark and rays in 2008. I knew there could be a whole lot more than just surface fiji cruises, but I never had an idea it would be that stunning underwater. For the record, I don't think I'd like to get in the water with the Great White though. I see a truck load of great underwater photography opportunities. I might need to stock up on memory cards though to make sure I can take all the shots I want. What about South Africa? If you do one visit in May, June you can travel up the coast from Cape Point and do white shark cage dives (including hunting, breaching great whites), blue and mako pelagic dives, seven gill cowshark dives all from one harbour in maybe 2 days! Then move up the coast to Port St Johns and follow the Sardine run for your bronze whalers, bull, thresher sharks and more at the Sardine run, free dive with groups of up to 50 blacktip sharks off of Protea Banks, with guarenteed sightings of massive tiger sharks, bull sharks and sometimes hammerheads.. Move to Raggies cave and see up to 30+ nurse sharks in one set of caves.. Another 200km up the coast and you're in Mozambique where they can guarentee whale sharks sightings.. When I was there they saw 8 on one boat ride - the guides say that is an average ride.. The prices are way better than those places listed above.. And the variety of species is far greater than any of those places listed above..
One of the most treasured pieces of nature, better yet tourist coming by should cooperate in keeping our environment clean and livable for their kinds. The benefit will not be for them but, for us as well. You forgot to mention meeting the amazing Oceanic White Tips at Elphinstone in the Egyptian Red Sea. In incredible and humbling experience. Wow, what a list of diving destinations! Personally have only done the Fiji dive on that list, but looks like a good bucket list to me! Is the Honduras submarine trip really a public tour?